Home › Theology › What Are Spiritual Gifts, and How Do I Discover Mine? Have you ever wondered what your life’s purpose is? What it is that God wants you to do? We know that God doesn’t just whisk people off to heaven the minute they become believers in Christ, so obviously he has something he wants to accomplish with our lives here on earth. Part of that purpose is to proclaim the gospel and help other people become followers of Jesus (see Matthew 28:18-20). Another part is to do “good works, which God prepared ahead of time for us to do” (Ephesians 2:10), so that our lives lead people to give glory to God. That might sound intimidating (it often does to me)! But the good news is, Christ doesn’t leave us to do all of that on our own. He places his Holy Spirit in us to empower us, and he places us into a larger family of believers (the church) to work and grow alongside of. And that’s not all. The apostle Paul tells us over and over again that God gives every Christ-follower special gifts or abilities to use for the purpose of building up the church and making disciples. We call these “spiritual gifts,” and the New Testament makes very clear that everyone who becomes a believer in Christ gets one (or maybe more!). But what the gifts actually are and how they work today is often misunderstood by many Christians. Now, I won’t try to answer every question about spiritual gifts here (whole books have been written about that!). But I do want to offer an explanation of what the Bible means when it talks about spiritual gifts, and how you can start discovering yours. The most basic thing about them is . . . they’re gifts! They come from God’s overflowing generosity. That means they’re not anything to be intimidated by (even the more esoteric-sounding ones, like the ability to prophesy or to speak in unlearned languages). In fact, the word we see most often translated as “spiritual gift” in the New Testament is the word charisma (or charismata), and it comes from the Greek word for “grace.” So literally these gifts are operations of God’s grace. They’re favors that we don’t earn, but are freely given to us so that we can carry out the good purposes our heavenly Father has for our lives. What’s more, Paul calls these gifts “manifestations of the Spirit” (1 Corinthians 12:7). That’s a fancy way of saying that when you’re using your spiritual gift, God himself is present working through you! The gifts are ways that the Spirit of Christ graciously reveals his presence in and through you, in such a way that others around you recognize that God is at work. One way of putting it that I like is that a spiritual gift is something God gives to you so that he can work through you. This idea of a spiritual gift being a manifestation or embodiment of God’s activity is what makes all the difference when it comes to certain ones like teaching, administration, or acts of generosity. These are things even non-Christians can be good at — you can be naturally talented at them. So how could those be spiritual gifts? Well, it’s when they point people to God! What makes for a spiritual gift of, say, teaching for example, is that the people you teach feel the presence and power of God when you’re teaching. What would ordinarily seem like a natural talent ends up having a supernatural impact. And it builds up the church and brings glory to God. The apostle Paul gives us several different lists of spiritual gifts: 1 Corinthians 12:7-10; 1 Corinthians 12:28; Romans 12:6-8; and Ephesians 4:11-12. What’s interesting is that while there is some overlap in these lists, there are also differences. Some gifts only show up in one or two of them and not the others. Some of the passages list roles or offices as gifts — like apostle, pastor, etc. — while others focus on abilities. Most Bible scholars take this to mean that these lists are by no means exhaustive. Paul gives us some representative examples, but there may be as many spiritual gifts as there are needs in the church! Looking at our modern context, God may (and I believe he certainly does) gift certain people in the church with extraordinary expertise in using media and technology, for example. Or he can equip people with a gift for leading praise and worship, or for organizing local outreach, or for helping Christians navigate tough questions about political involvement or social justice. How Do I Find Out What My Gift Is? Now that we’ve defined a spiritual gift as a manifestation or embodiment of God’s grace through a believer, we can hopefully start to see how it is that we discover what our gifting (or giftings!) might be. One way that a lot of churches go about it is by having people complete a “Spiritual Gifts Inventory” or some other type of survey that’s supposed to indicate what your gift might be. And that can be a useful tool in some cases, but I don’t think it’s necessarily the best way to discover your gift. For one thing, as I mentioned before, there might be more gifts than just what’s listed on the survey! For another, the more I’ve studied spiritual gifts, and the more I’ve personally seen of how God tends to do his kingdom-work in the lives of his people, the more convinced I am of the importance of relationships when it comes to discovering your gifts. We need the honest input of other believers — not just an impersonal survey. God never intended the Christian life to be a solo effort. He wants us to work together as the church, just like the parts of a body work together. Spiritual gifts are not meant to be about personal fulfillment, or finding your best life; they’re about bringing glory to Christ as part of his church. They’re given, as Paul says, “to equip God’s people to do his work and build up the church, the body of Christ” (Ephesians 4:12, NLT). So for my part, I’m convinced the best way to discover your gifts is through prayerful examination of your own spiritual walk, and through getting the input of trustworthy believers around you. It takes discernment and seeking the guidance of the Holy Spirit. In some cases, it might even mean trying some ministry activities out. And it might take some time — after all, there’s no microwaving a relationship with God! What are things God has made me excel at that I can do to build up the church? Is there anything I’m already doing that other people say they see God’s hand in? Do my pastors/mentors see me excelling in a certain ministry area or activity? What ministry needs do I see around me that I’m passionate about meeting? And if you already know what your spiritual gifts are, hopefully you’re putting them to use for God’s kingdom and glory! 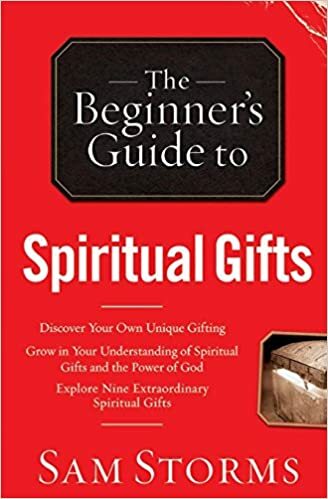 Check out Sam Storms’s fantastic resource, The Beginner’s Guide to Spiritual Gifts. ‹ Are Modern Christian Holidays “Unbiblical”?